If you have questions about your purchase, registration or customer account, please read the Customer FAQ below. You can also read the Order FAQ if you have questions about Axialis order policies. When you purchase an Axialis product (on the Web or elsewhere) you're not automatically registered as a customer. The first time you install the product, you have to register online using either the feature included in the program or using the online form. The first time you register an Axialis product, you have to create a customer account (specifying a new username, a password, your name, address...). Once this account is created (don't forget your username and password), you can register several Axialis product using it. Also, All recent releases of our programs are provided with a Product Key. This key is unique to you and will permit our services to authenticate your copy. You'll need it to access all our future online features (upgrades, support, downloads, special prices...). Don't loose it. Free upgrades. This is Axialis lifetime license. Buy once and get free upgrades for the rest of your life. You need to register to access our online upgrade system and get the latest versions for free. Priority support. Registered customers are treated as priority users. Receive special rebates and news. You periodically receive special news and rebates on new products in your mailbox. 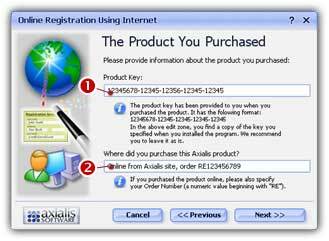 When you purchase an Axialis product (on the Web or elsewhere) you're not automatically registered as a customer. The first time you install the product, you have to register online. If you want to get more information on the registration benefits, click here. To register, you can either use the feature included in the program (see below) or using the online form. As the registration will be made online, check that you're connected to the Internet before proceeding. If you access the Internet through a firewall or proxy, contact your network administrator to get more information on your LAN configuration. Launch the application and follow the procedure below. 1. Launch your Axialis product. Open the menu and choose Help/Online Registration. To register, you must specify yourself as a customer. If this is the first time you register using this online system, choose "New Customer". Otherwise, specify your personal login data. 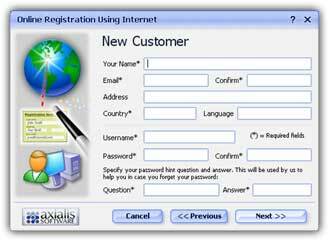 • Check the "I'm a New customer (or I don't have a Username)" option ( ) if you've never registered an Axialis Product using this online registration system. Choose this option only if you don't have an Axialis Customer username/password login data. Click Next and go to step 5. • Check the "I already have a Username" option ( ) if you've already registered an Axialis Product using this online registration system. 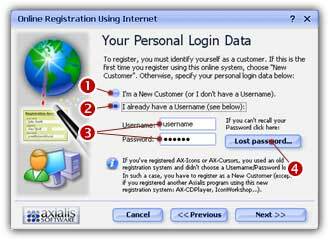 Choose this option only if you have an Axialis Customer username/password logon data. 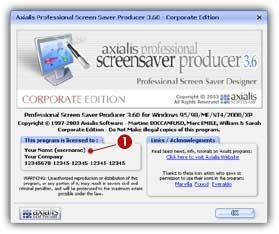 If you've registered another Axialis program using this new registration system (such as AX-CDPlayer, Screen Saver Producer, IconWorkshop) you should already have an Axialis username. If you think you've lost this username, click here to retrieve it. • Specify in the Username area ( ), your personal Axialis Customer Username. If you're already an Axialis customer (if you already have registered a program using this new online registration system, not the old one), you should have a personal Username. The username is not case sensitive. • Specify in the Password area ( ) your personal Axialis Customer Password. If you're already an Axialis customer (if you already have registered a program using this new online registration system, not the old one), you should have a personal Password. The password is not case sensitive. Click Next and go to step 6. If you have lost your password click on the Lost Password button ( ). A Web page will open and your personal hint question will be asked to you. If your answer is correct, your password is displayed. You specify the hint question and answer when you create your customer account (new customer). • Name - Specify your Name here. This is not a username but your Real Name. Ex: "John Smith". • Email - Specify here your personal e-mail address. This address is important. It will be used to send you information about new products, offers... Confirm this address in the Confirm field. • Address - Specify here your personal address (street, city, state, zip...). This field is facultative. • Country - Specify here your country. • Language - Specify here your preferred language. This field is facultative. • Username - Specify here your desired Username. As a new customer you must specify a new username. If the username you specified already exists, you will be asked to choose a different one. This field is not case sensitive and must contain at least 6 characters. This field is very important: it must be easy to remember, but not too easy! It's not recommended to specify spaces in your username. • Password - Specify here your Password. As a new customer you must specify a new password. This field is not case sensitive and must contain at least 6 characters. This field is very important: it must be easy to remember, but not too easy! It's not recommended to specify spaces in your password. Confirm this password in the Confirm field. This confirmation is useful to avoid errors. • Question - Specify here your password Hint Question. If you have lost your password, you'll be able to retrieve it using this question. In such a case, your personal hint question will be asked to you. If your answer is correct (if it matches your hint answer) then your password will be given to you. Specify a personal question only. Ex: "What's the last name of your neighbor?". • Answer - Specify here your password Hint Answer. If you have lost your password, you'll be able to retrieve it using this answer. In such a case, your personal hint question will be asked to you. If your answer is correct (if it matches this hint answer) then your password will be given to you. Specify short answer that must not be too easy for other people. This field is not case sensitive. It's not recommended to specify spaces in your answer. Please provide information about the product your purchased. • In the Product Key area ( ), specify the product key you received when you purchased the product. This product key has the following format: 12345678-12345-12345-12345-12345. In this edit zone, you find a copy of the key you specified when you installed the program. We recommend you to leave it as is. • In the Where did you purchase area ( ), enter the name of the reseller (or Web site) where you purchased the program. Please also specify the order number (if any). 7. A Ready to Register dialog box opens. You are about to send your registration information. You must be connected to Internet before proceeding. If you are not connected to Internet, please connect now. If you access the Internet through a firewall or proxy, contact your network administrator to get more information on your LAN configuration. If you're using a modem, check that you're connected to Internet and click Register Now. • Address & Port - Specify here the HTTP Proxy address and port number (usually 80). • Login & Password - Specify here the Proxy Authentication Login & Password. 9. Congratulations! You're a registered customer! When you purchase an Axialis product (on the Web or elsewhere) you're not automatically registered as a customer. Therefore, you don't have any customer account automatically created on our server. The first time you install an Axialis product, you have to register as a new customer. Once this first registration is done, your account is created. The first time you registered an Axialis product, you declared yourself as a New Customer. During the registration process, you filled the New Customer dialog box (see below). • Username ( ) - You specified your username here. This data has been chosen by you, not provided by Axialis. The username has at least 6 characters and it not case sensitive. If you can't recall your username, see below. • Password ( ) - You specified your password here. The password has at least 6 characters and it not case sensitive. If you can't recall your password click here. I can't recall my username. How to proceed? In the License area ( ), you'll find your name and your username in parenthesis. You'll also find your product key below (if your version needs a product key). I can't recall my password. How to proceed? First, you need either your username (see above), the email you specified when you created your account or your product key. Then, visit this page to retrieve your data including your password (more info on the page). How to verify if my account is valid? You just have to login to your account from this page. You need your username and password to login. I want to access my account, what's my username? The easiest way to retrieve your username is to open your Axialis product and choose the menu Help/About. A dialog box opens. In the License area, you'll find your name and your username in parenthesis. You'll also find your product key below (if your version needs a product key). I've lost everything including the product. How to proceed? Visit this page and choose the first option "using your email". Enter the Email you specified in your account. If it exists in our database, your login information (username, password) will be sent at this email. If you failed with this procedure or if the email no longer exists, contact us specifying information about you and your purchase (order#, email, name, address, approx date...). How to verify that my account is valid? You create a customer account the first time you register a product. The first time you install an Axialis product, you register as a new customer. Once this first registration is done, your account is created. To register, you can either use the feature included in the program (see above 'How to register my product') or using the online form. Do I have a product key? Products keys are numerical strings which have the following format: 12345678-12345-12345-12345-12345. They're provided with the products during purchase. This is used by us to authenticate your product as an original purchase. This key is required to get some services (now and in the future) from Axialis. For example, actually you need your product key to upgrade online. DO NOT share your key with anyone. If sharing is detected on our server your key will be invalidated and you won't be able to access Axialis services. In the future, all products will use a product key. If you actually use a product like AX-Cursors, MediaBrowser or AX-CDPlayer, you'll receive a key with next update. I've lost my product key, how to retrieve it? In the License area ( ), you'll find your product key (at the bottom of the box). I've lost my product. How to proceed? The product key is included in the registration database. You can therefore retrieve it by accessing your account online. To login to your account, visit this page. You'll need your username and password to login. If you've lost your username, click here. If you failed with this procedure, contact us specifying information about you and your purchase (order#, email, name, address, approx date...). With our Litetime License, you pay for the product only the first time and get all new versions for FREE and for LIFETIME (learn more). I've lost my copy, do I have to purchase again? 1. Login to your account from this page. You need your username and password to access your account. If you can't recall your username read this. 2. Choose the option "Download a product" in the menu. A list containing the product you've registered is displayed. 3. Click "Receive a download link" for the desired product. 4. A few seconds later, you receive an email with a personal download link in your mailbox. If you failed with the above procedure, contact us specifying information about you and your purchase (order#, email, name, address, approx date...). We'll do our best to search and send you a link as soon as possible. A built-in feature permits you to upgrade online automatically. You must be registered as an Axialis customer and your account must be active. You also need your username and password to upgrade. This feature will contact the Axialis server and download an upgrade patch that will be automatically applied. In a few minutes, your product is upgraded to the latest version. This is the easiest and fastest way to proceed. 1. Launch your product. In the menu, select Help/Free Online Upgrade or press Ctrl+F8. Should I activate the trial version? If you have the latest version of IconWorkshop 6.90 or later, yes, you can activate the trial with the product key. Otherwise, you have to download the full version using the link provided in the confirmation email and install it over the trial version. Do I receive a boxed software? No. We deliver our products as download (a.k.a. ESD) only. What are Axialis return and refund policies? We want you to make the best purchase decision. Therefore, we recommend that you take advantage of our free trial software downloads. We also encourage you to explore the product pages of our website to obtain comprehensive product information. In the event that you need to return an Axialis product, you must make your request within 30 days of purchase. Additionally, Axialis reserves the right to deny a refund in the case of a non-authenticated purchase (no order#, bad name or address...). To request a refund for your downloaded (ESD) software purchase, please contact us. In your message, you should explain what the problem was and why you want to return the product, include your order#, name, e-mail address and the product key (if any). You will find the order# and the product key in the purchase confirmation e-mail. We expect that you have destroyed all downloaded files and have not been copied or saved in any other way. You will be asked to sign a letter of destruction and return it (by fax or postal mail) before you receive your refund amount. If you've ordered a Backup CD, you'll be asked to physically destroy it. Your product key will be invalidated on our server and associated services won't be accessible anymore. Once your refund request has been reviewed, we receive the Letter of Destruction, and we approve the refund; we will send our consent to process the refund to SWREG. We will contact you by email to confirm the refund process has been launched. Your refund will be credited to the credit card charged during your original transaction within a few days. You'll be refunded of the paid amount without fees. However, the Backup USB fees (if you have chosen this option) are not refundable. Is European VAT applicable to Axialis products? European customers ONLY have to pay local VAT. SWREG®, our payment prider, is located in the USA. Since July 2003, European customers have to pay VAT for ESD goods purchased in the USA. The VAT rates vary from one country to each other in Europe. However, companies who specify a EU VAT number at checkout do not pay VAT. Yes, this is an option that you can choose at checkout.